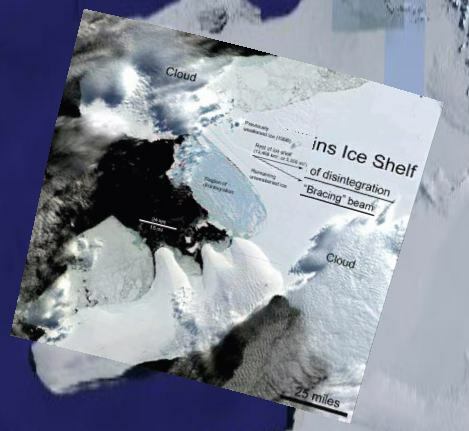 The imagery of the disintegration of the Wilkins Ice Shelf on the Antarctic Peninsula is really awesome — check out the video of the massive icebergs floating in formation below — but the implications, of course, are somewhat dire. The KMZ file comprises two overlays, one of them at a higher resolution, both carefully positioned to minimize distortion. Do play with the opacity sliders to see the before-and-after effect. No more Exxon Kool-Aid for you Nixon! How about the loss of over a million square kilometers of Arctic sea ice in two years then? Worrying about the loss of sea ice in Arctic. According to the first link David posted, it’s the lowest since taking measurements. Which started in 1979. Oooo nooooo!! Cycle of life. Live it, love it. * ship and aircraft records from before satellites suggest a 50 percent drop since the 1950s. * explorers like Amundsen spent years in the Arctic looking for the fabled Northwest Passage, which only just opened fully for the first time in history. The key word is suggests. Not quantified, like using the satellites. 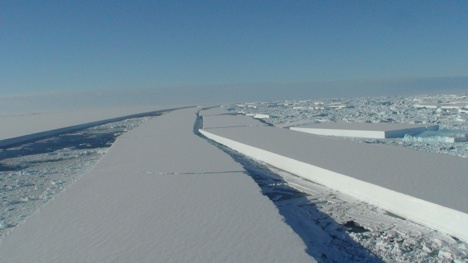 First time in history the northwest passage opened? Are we sure of that? How far back do we have accurate historical records? History of the planet started long before man recorded it. And it’s not the first or won’t be the last time, we have “climate change” refugees. Please…go ahead and jump off the bridge with everyone else. The water isn’t as cool as use to be. IPCC…hahaha. You might want to investigate that whole mess before putting too much faith in them. What timespan would one need to compare with to convince you that something is wrong then? Would 800,000 years worth of ice core data cut it? Sure, the climate has changed before, ice ages coming and going.. So how could it harm anyone if it’s changing now? The reason is that the current changes are happening a lot faster, many ecosystems and species won’t be able to adapt like they would to slower natural changes. Plus the earth is already under considerable stress from other mankind activities (species going extinct 1,000 – 10,000 times faster than normal, half the worlds forests already cut down etc.). Sure, there has been problems with the IPCC. For example in 2001 ExxonMobil got George Bush to pressure the IPCC into removing Robert Watson as chairman.. In general though, the IPCC reports are compiled from work by thousands of expert scientists that each have far better qualifications on this subject than you, me, or any economists or thinktanks on the Exxon payroll.. When people use the lame Exxon or even the Bush retort…then people are beyond help. Keep reading and drinking the one-sided Kool-aid. Kool-aid tastes better if it’s read and drank from both sides. I would say have a good one. But I know you won’t, since you are too worried about the sky is falling. I have some great future beach front property to sell!! Or better yet, I have carbon credits to sell. I can’t let Mother AlGore have all the fun making money off saps. Stable climate…gave me a good laugh. I wished I had 60-65F days all year around. Would be great, let’s make it happen. Finally note, pollution bad, climate change is a eye-roller. I’m sorry that you feel I am beyond help. Presuming you wont get stuck in despair on stage #4 you should soon be ready to join the world in helping to solve one of the most pressing issues of our time. Like it or not in 1968 we had twenty years to change (change being getting rid of coal power and gas cars) or the changes would become irreversible. We did the opposite and now we pay the price. The price is starting to show up as people are running out of water from glacial melt, this will get much worse. Mass migration out of the Middle East, India, China and Indonesia will turn into a blood bath. Most of the large rivers in that area are fed by snow fall in the Himalayas. Most of the worlds population lives in these country’s and when they start moving to find water, well you get the picture. First and foremost..check all “scientists” and see where their money is coming from. What you will find is the vast majority of the ones supporting doom and gloom and calling CO2 and greenhouse gas(that is going to alter climate horribly) are supported by research grants and donations by left wing organizations who are doing their best to move more money from the US to the their cronies around the world. When you get all your resarch money from George Soros or his cronies…you find that if your research doesnt add up to climate change…then suddenly you dont have money anymore. What is fascinating is that left wingers decry scientists who get money from oil companies and such…but ignore their own….